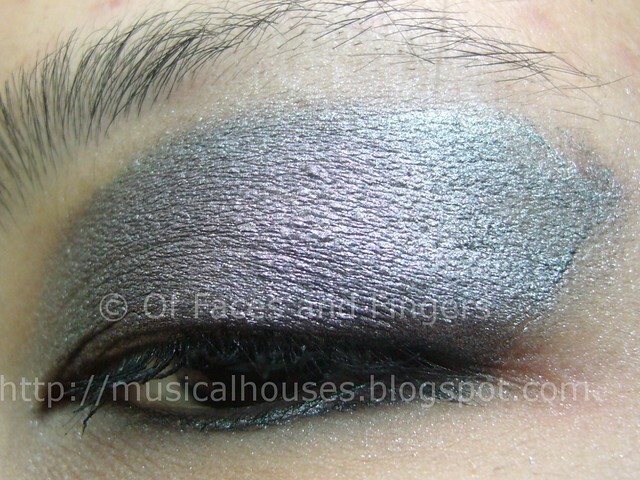 Ooh, hello there metallic eyes, thanks to Sleek's Molten Metal eyeshadow, I officially haz you! 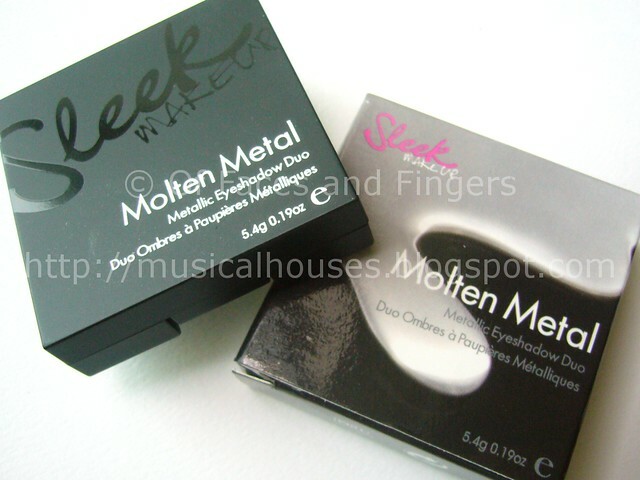 Sleek Makeup has done it again, with their latest Molten Metal cream eyeshadow duo in Steel and Ash. 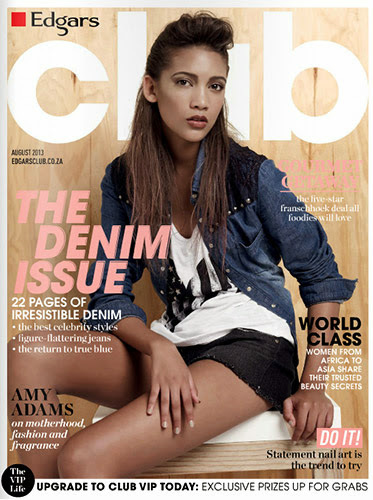 May I have your attention, ladies and gents, and direct your attention to just how gorgeous this is? Isn't it a beauty? Good things come in small packages, and the Sleek Molten Metals is no exception. You get a small box with a tiny plastic case inside. Don't be fooled by the packaging, however. 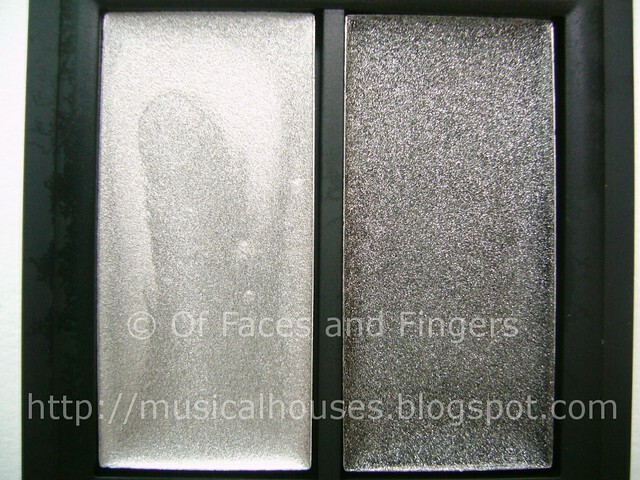 Inside this plastic case are two nicely-sized pans of cream eyeshadow. Don't they look so gorgeous and metallic and futuristic? 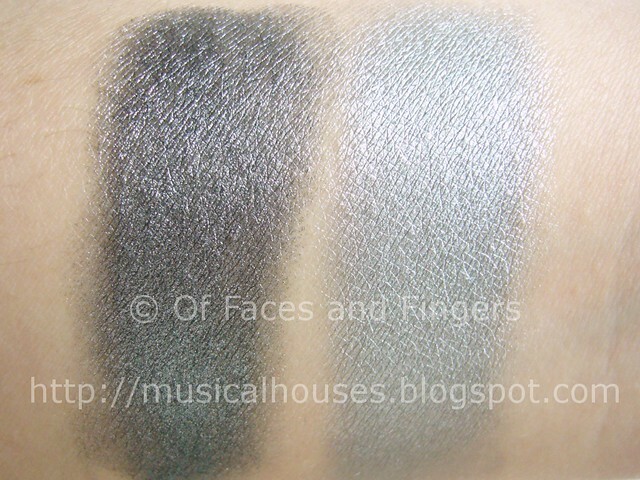 Steel is on the left, and as the name suggests, is a very pretty metallic silver grey shade that does really look like steel, while Ash on the left is a deep metallic black base with silver glitter. Both Steel and Ash are very nicely pigmented, but can also be sheered out if so desired. But when used at full strength, the Molten Metal really looks shiny and metallic, just like liquid metal. The swatches below illustrate this. 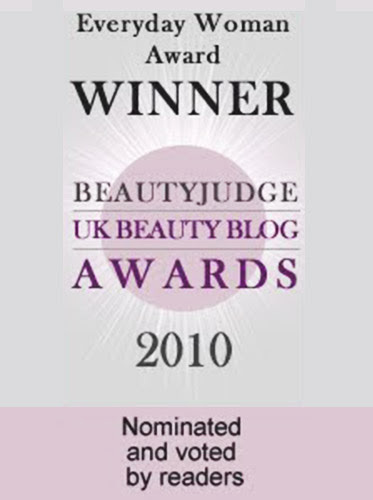 The texture of the Molten Metal eyeshadows is soft and creamy, and very blendable. When you blend both Steel and Ash together, you get a very pretty deep gunmetal grey. The eye look below uses the Molten Metal. I really love this look. I feel like my eyes are all metallic and futuristic and spaceship-y! Steel is used on the lid area, while Ash is used in the outer corner and contour area. 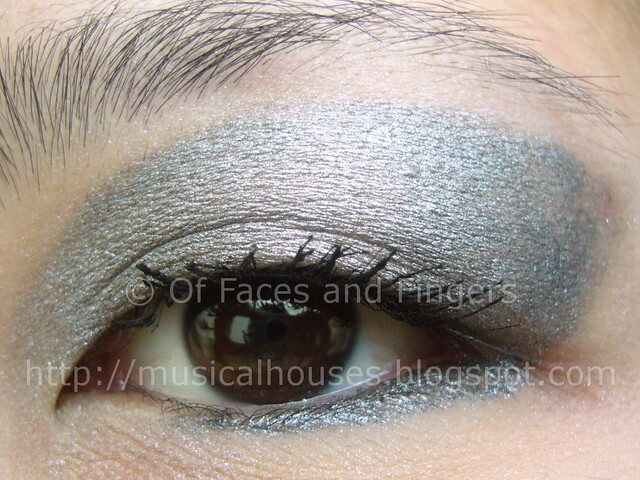 I didn't have any trouble with the blending or the layering of the eyeshadows. However, I did find that if you are going to layer several layers of the cream on top of each other, it can get tricky as the shadows will shift around and start caking up a little. I started off using my fingers, but I found that my fingers tended to shift the product around too much, and so I ended up using a synthetic brush instead, to much better effect. I was using my Stila Concealer Brush #26, but really, any appropriately-sized synthetic brush will do. Because the shadows are very creamy in texture, you do need a base, or else you have to set the cream with a powder on top to prevent the shadow from moving. 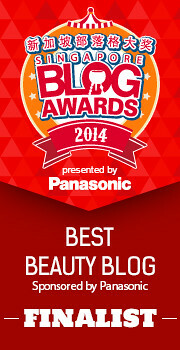 Here, I just took a little bit of translucent powder and used it to set the cream. It did dull the metallic finish somewhat, but only by a little. Which is a little bit of a pity, since it really looks so metallic! Another great use of the Molten Metal would be as a base for other shadows. This would be doing double duty - the powder eyeshadow on top would add some extra oomph to the eye look, as well as prevent the cream shadows from creasing or moving. I think glittery shades would especially be super kickass...I mean, can you imagine glitter bits on top of a metallic foil base? Oh, the possibilities! 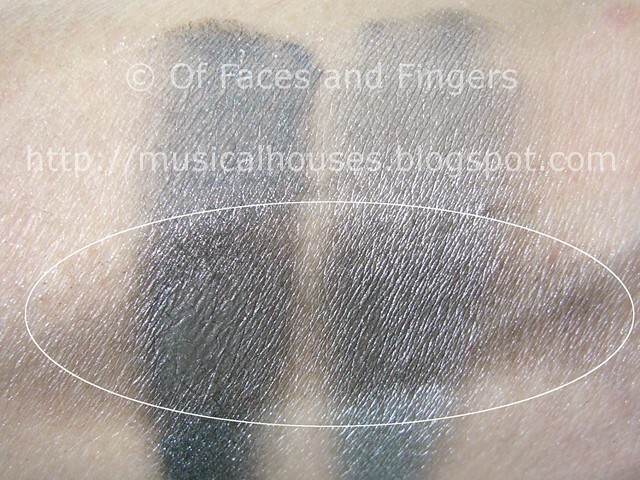 Here's a swatch of a brown eyeshadow over the two shades. 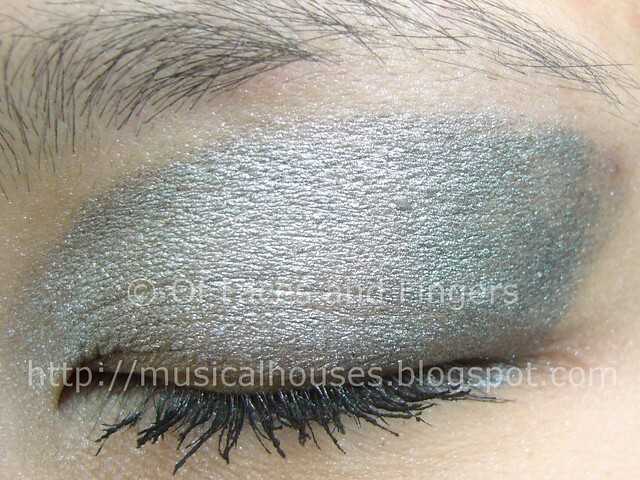 The circled part indicates where I swiped the eyeshadow over the Molten Metal. 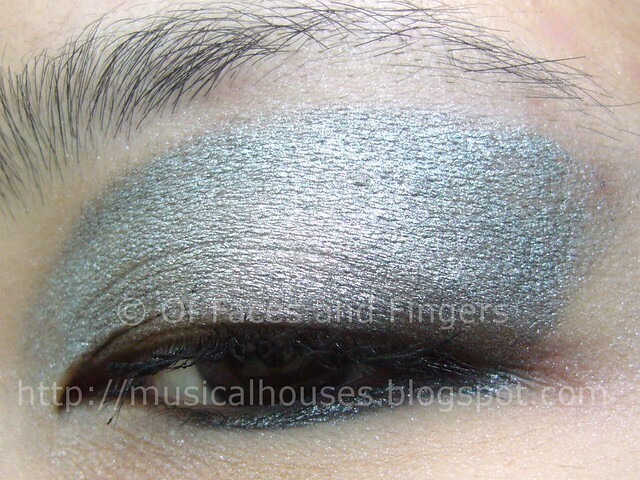 Since the Molten Metals are pretty pigmented, lighter colours don't really have that layering effect, as the cream eyeshadow is still visible through the powder on top of it. 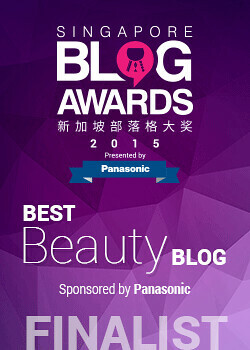 With darker eyeshadows, the effect is better. You do get a tint of the darker colour, but as you can see, the underlying colours of the Molten Metals still show through. Here's a quick demonstration where I layered a purple shade over the cream eyeshadows. This seemed to work pretty well. I couldn't quite capture this look very effectively as the grey in the cream eyeshadows kept showing through, so this shot below is the best I could get. You can see the purple most obviously in the middle of the lid. I feel like it gives the entire look a little more dimension, with the purple going into the light grey and blending out into the dark grey...Very pretty! I kinda wished I'd used a more exciting colour to show this colour shift (like gold or red or something), but I really just used whatever eyeshadow was lying around, so deep purple it was. Although the Molten Metal eyeshadows may be slightly more fussy to use (for me powder is general easier), but their gorgeous metallic finish makes it all worth the trouble. I also like the idea of using the Molten Metals as a base for other eye looks, and I imagine the possibilities could be endless when used this way. If you want an affordable cream eyeshadow that gives that really gives you look of a liquid metal, this is definitely worth checking out. Love the colors. Fun for night time. So beautiful! I love this shade! I like both of them, and even though the color doesn't layer well I really like the effect layer DOES get. Like subtle rainbow on a shimmery fabric. love the colours.. O___O they look amazing. I've consider buying Molted Metal but the golden one for some time now, and now you really convinced me to get to it! but now I want both of them!! !